Sooraj Pancholi, who was last seen in 2015's Hero is all set to star in director Irfan Kamal's Satellite Shankar. On Tuesday, Salman Khan, who had also produced Sooraj's debut film, shared the first poster of Satellite Shankar on Twitter and wished him luck for his latest project. "India ko connect karega India ka naya hero. Sooraj Pancholi in and as Satellite Shankar looking superb. Sooraj Pancholi, all the best," Salman captioned the first look poster Satellite Shankar. The poster features Sooraj in printed camouflage pants and in olive green tee carrying a backpack. On the poster are inscribed the word: "Not all heroes go to the battlefield." Nothing much has been revealed about Sooraj's character or the cast of the film. 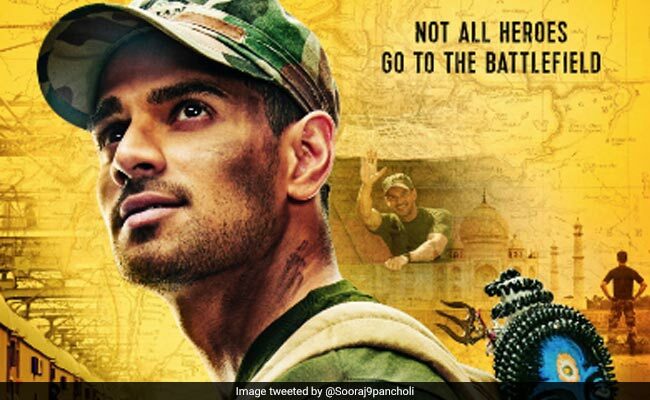 Sooraj Pancholi also shared the poster on social media and wrote: "Not just a hero on the battlefield! Feeling proud and blessed presenting you the official poster of Satellite Shankar Releasing 5th July 2019!" Athiya Shetty, Sooraj Pancholi's co-star from his debut film Hero also shared the poster. Sooraj Pancholi, who made his Bollywood debut with Hero opposite Athiya Shetty, did not feature in any other film since then. He had appered in a Gurinder Seagal's song video GF BF, which also featured Jacqueline Fernandez. The 29-year-old actor is part of dance film Time To Dance. The film will also star Katrina Kaif's sister Isabelle, who is making her Bollywood debut with the movie. Isabelle plays the role of a ballroom dancer while Sooraj Pancholi is a street dancer. Salman Khan is co-producing Time To Dance, which went on floors in London last year.